1.DIY CRAFT PROJECTS: Update your house decor with an industrial look that will impress your family and friends! Perfect for at home Do-It-Yourself and restoration projects. Create stunning designs of bookshelves, desks, and television stands . 2.INDUSTRIAL STANDARD: For easy functionality and interchangeability our elbows have been formulated to meet national standards. 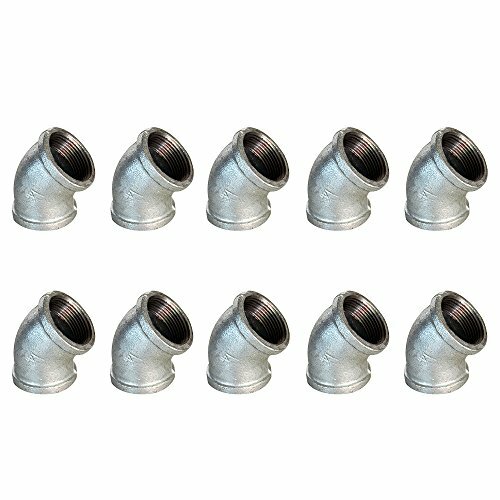 3.SECURE FITTINGS: We constructed our premium products to easily attach to pipes. You can securely anchor your fittings to the pipes to secure your do-it-yourself furniture such as: bookshelves, tables, t.v. stands, shelves, bed frames, pallet furniture, and lighting. 4.100% SATISFACTION GUARANTEED- We are deeply confident in the quality of our elbows. Buy now and enjoy our 7-Day Money Back Guarantee. No questions asked. Be worry free!
? 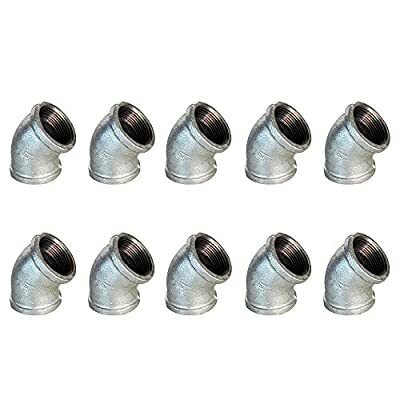 OUR QUALITY - Each 45 deg elbow is made from strong, industrial malleable iron. The black rustic design will bring the perfect appeal to any project! ? GREAT FOR ANY PROJECT - Elbows can be used to make pipe furniture, clothing racks, shelving, pipe table legs, and any industrial decor. ? THE PERFECT FIT - Each 45 deg elbow has high quality pipe threads. ? MODERN DECOR - Our unique black surface treatment technology creates a beautiful appearance and prevents them from rusting. Additionally, our iron products do not have "CHINA" stamped on them which makes them the best products available! ? LIFETIME WARRANTY - Love them or we'll buy them back from you, no questions asked!